When Patrick and Michael buy a rambling, dilapidated house on Vieques Island off the eastern coast of Puerto Rico, they can hardly believe their luck—or how much work lies ahead of them. Renovating their little corner of paradise proves to be a crash course in how Vieques works—and how it doesn’t. Few projects go according to plan and many veer alarmingly off course. Along the way they learn a number of unforgettable lessons: concrete houses can have termites; five-foot iguanas aren’t necessarily more afraid of you than you are of them; emergency rooms don’t always stock medical supplies; and a property manager who paints your house orange instead of yellow may resign in a huff when you point out his little boo-boo. 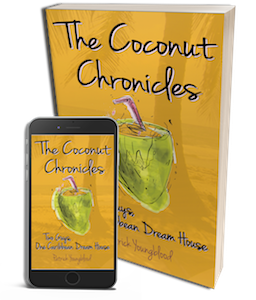 The Coconut Chronicles is a lighthearted account of Patrick’s and Michael’s battle to create order out of chaos in the not-always relaxing tropics. Patrick Youngblood and his husband Michael Wiack first traveled to Vieques, Puerto Rico in 2003. They bought a house on the island in 2004 and spent several adventure-filled years struggling with fate and Puerto Rican bureaucracy to renovate their new home. Patrick’s interest in home renovation springs from his lifelong fascination with architecture and design. He holds a Ph.D. in art history from the University of London and has published articles in the New York Times, Burlington Magazine and History Today. For the past 20 years he has lived and worked in Washington, D.C.